After months of anticipation, Twitter finally ripped off the Band-Aid Thursday and laid out the changes to how it shares data with developers. The message is as clear as ever: Twitter doesn’t want any client apps that aren’t made by Twitter itself. For those clients that are already out there, the changes will not destroy their business, but unfortunately, what the new guidelines will destroy is the possibility of Twitter streams being integrated into the rest of the Web. According to Twitter, in any client, “Tweets that are grouped together into a timeline should not be rendered with non-Twitter content. e.g. comments, updates from other networks.” Twitter’s Display Guidelines are now called Requirements. Apps that don’t meet the requirements can be cut off from the service. Flipboard’s Twitter functionality is toast. That explains at least part of why CEO Mike McCue left Twitter’s board this month. For people who love an existing Twitter app, though, things will stay more or less the same. Currently third-party apps can have up to 100,000 users. Beyond that, they need special permission from Twitter (and traditional clients won’t get it). Clients that already have more than 100,000 users are allowed to grow up to 200% of their existing user base, and then they hit a hard limit – that’s the total number of unique users the app will ever be able to have. We can expect prices for existing Twitter apps to rise. And who can blame developers? Twitter has just put a limit on how many apps they can sell. They won’t be cut off, though, so Tweetbot users can take a little solace in that. For now, as long as tweets meet the Display Requirements, are the right shape and have all the right buttons in the right places, Twitter clients will be allowed to continue displaying them. But it’s not hard to imagine the next change down the line, which is for Twitter to hand clients its own, fully rendered tweets that can’t be customized. There are also some changes to the ways apps can call the service. They might put the squeeze on power users, but they’ll still work mostly fine. In the blog post announcing the changes, Twitter’s director of consumer product, Michael Sippey, illustrated the kinds of client applications Twitter wants and doesn’t want using a two-axis chart. 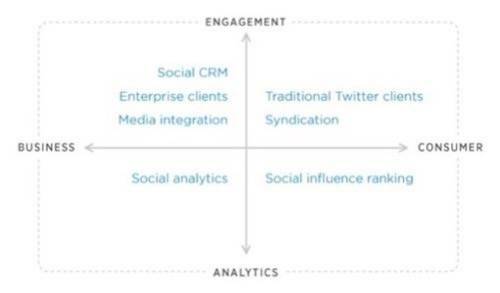 There is one quadrant, the upper-right, where Twitter doesn’t want developers to build, as they’ve said for over a year. Those are the consumer apps for engagement with Twitter, including traditional Twitter clients and apps that syndicate content. Instead of making apps that repurpose Twitter for anything other than what Twitter deems fit, Twitter wants developers to build new ways to use Twitter Cards, the multimedia boxes that can be displayed inside tweets. A less minimal, media-rich experience is what we should expect from Twitter going forward.